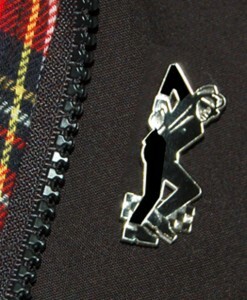 This classic iconic design of the 2 Tone Nutty Dancer is now available as a metal enamel badge in chrome and black. Measures 38mm in height. It has a safety clasp on the back so that you do not lose it. I am the original designer of the “Nutty Dancer” icon logo for the Madness single “Madness” and “The Prince” on 2 Tone Records over 30 years ago. Beware of unofficial sellers of this design on badges, T-Shirts and memorabilia that use this design without permission. Only buy originals from original designers. Every badge is supplied with a signed John Sims aka Teflon certificate of authenticity making it a collectable item. Preferred payment by Pay Pal. Postage price given for UK inland only. Outside of UK please email: teflon@2toneposters.co.uk for details. I will combine shipping on multiple orders. If your order is lost or damaged, I will make a claim with the Royal Mail. The Royal mail will have to investigate the claim before any refund is issued, this can take around 4 weeks to complete. We cannot issue a full refund until the claim is settled and agreed by the Royal Mail, this is to protect ourselves and the Royal Mail against fraudulent claims. 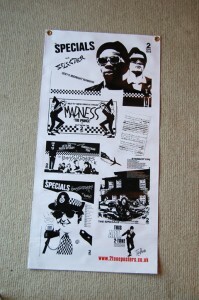 Not in the 2 Tone Posters shop yet but decided to offer these again as website is being updated. Brand new & unused. This classic iconic design of the 2 Tone Nutty Dancer is now available as a metal enamel badge in chrome and black. Measures 38mm in height. It has a safety clasp on the back so that you do not lose it. Teflon original design of the “Nutty Dancer” icon logo for the Madness single “Madness” and “The Prince” on 2 Tone Records over 30 years ago. Beware of unofficial sellers of this design on badges, T-Shirts and memorabilia that use this design without permission. Only buy originals from original designers or official products and licensees. Every badge is supplied with a certificate of authenticity making it a collectable item. 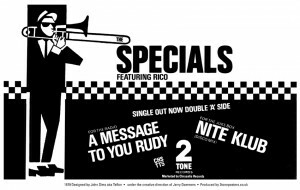 An interview I did with Billy Albert on 2 Tone designs back in January gets published in next month’s Record Collector DECEMBER issue out Nov 3 for all you rudies out there. Some real insights to those designs. Billy is a 70s poster collector and has a new website up: www.poprockposters.com showing some real cool posters of that era. You are currently browsing the classic 2-tone graphics news archives for October, 2011.